Natural beauty aficionados are always raving about the benefits of jojoba oil hair care and jojoba oil beauty tips. Pure jojoba oil natural hair care has real advantages that are affordable and easy to implement in your daily routine. These four jojoba hair oil benefits actually work without breaking the bank! 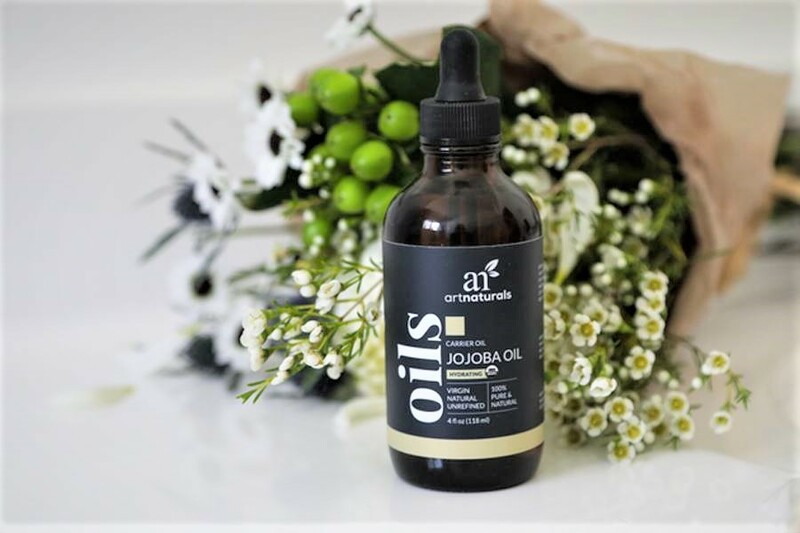 Authentic pure jojoba oil is a unique natural hair care product because its molecular composition is very similar to sebum which is an oil your body produces naturally. Though it’s commonly called an oil, the liquid produced from cold-pressing the seeds of the jojoba plant is actually something called a wax ester. Because jojoba oil is a wax ester similar to our natural oils, regularly using jojoba hair products doesn’t disrupt the natural balance of your hair. A simple way to get the balanced conditioning benefits of jojoba is to use natural conditioners formulated with jojoba oil. What it does: Jojoba oil mimics your skin’s natural oils and deeply conditions hair. Coconut oil adds moisture and thickens consistency. Lavender essential oil reduces fungus on scalp, and smells lovely. Step 1: Combine jojoba oil and other ingredients in bowl. Mix on high 7-10 minutes. Step 3: Apply a nickel to quarter-size dollop of conditioner to wet hair, focusing on ends and applying just lightly at roots. Step 4: Let set for 3-5 minutes, rinse well and style as usual. Step 5: Store your jojoba oil conditioner in the fridge to keep thick consistency. A dry, itchy scalp causes unsightly dandruff that not only flakes off on clothing, but can also build up and give your hair a dull appearance. New studies have linked the presence of bacteria on the scalp to the severity of dandruff. This suggests that one way to help reduce dandruff is to reduce bacteria on the scalp and a happy scalp means happy hair! Jojoba oil is a natural antimicrobial ingredient. Using jojoba oil hair care helps reduce the bacteria on your scalp without causing the extra dryness associated with harsh chemicals. Using a natural shampoo with jojoba oil and essential oils like tea tree oil (which also has antibacterial properties) not only helps reduce scalp bacteria but smells great too. What it does: Cleanses and conditions the scalp. Added essential oils, especially tea tree oil, help give an extra antifungal boost to help reduce the fungi that can cause dandruff. Rosemary and lavender essential oils also have antifungal properties and smell wonderful. Jojoba oil helps keep your scalp moisturized to avoid dryness and flaking. Step 1: Combine jojoba oil and essential oils in bottle. Cap tightly and shake well. Step 2: Use fingers to thoroughly massage jojoba oil mixture into scalp for 1-2 minutes. Step 3: Let sit for 2-3 minutes, rinse thoroughly. Shampoo and condition as usual. * For very fine hair, shampoo well before conditioning or skip your regular conditioner step. It doesn’t matter how fast your hair grows if you constantly lose length from breakage and trimming split ends. Keeping your hair well-conditioned with jojoba hair care is a good way to help avoid breakage and split ends from tangles. Well-conditioned, silky hair has a smooth hair shaft and hair follicles that lay flatter for a more manageable mane. The vitamins and minerals in Jojoba oil include vitamin E, vitamins C & B, copper and zinc, which are some of the best nutrients for conditioning hair. A good natural hair mask with jojoba oil will do the job...but we’ve also included a our DIY jojoba “hair smoothie” for deep conditioning. The fruity tropical scent will practically whisk you away to paradise. * For long hair or extra thick hair, consider doubling all ingredients. Enjoying the great outdoors is one of life’s greatest pleasures— but exposure to harsh elements is one of hair’s greatest enemies. Pure jojoba oil and hair products with jojoba can help defend against chlorinated pool water and harmful UV rays that are incredibly damaging for colored hair. Using leave in conditioners formulated with jojoba oil (or other natural oils) deeply condition to help restore moisture to dry locks after a dip in the pool. Well-conditioned hair also retains moisture and a quality, natural leave in conditioner can help provide a bit of a natural barrier against outdoor elements like dry wind and heat. Jojoba oil hair products take it a step further with natural UV protection, which can help keep your hair color from fading. Research into natural sunscreen agents rates jojoba oil as SPF 4. Our favorite homemade leave-in jojoba oil hair conditioner recipe is a summer must-have. * A glass bottle with a dropper if possible, but you can make do without if necessary. Step 4: Apply jojoba oil to hair focusing on the ends. *If your hair is generally oily, focus the jojoba oil mix on just the ends of your hair. However, if you’re applying before swimming go ahead and evenly coat your hair root to tip.